All of tests were completed using a Panasonic UHS-3 16GB SDHC memory card, Program mode, ISO 6400, flash off and all other settings at the factory defaults; unless noted otherwise. The Panasonic Lumix FZ2500 is an outstanding super-zoom digicam, sporting the power and performance that you would expect from a mid-level DSLR. Add to it its versatility and you have an awesome all-in-one camera for both stills and video. You are looking for a versatile all-in-one super-zoom camera that excels in both still image and video capture. This will make an outstanding travel camera. Panasonic's new Lumix FZ2500 is a powerful and versatile superzoom camera. It is not a very compact camera, actually larger than most mirrorless ILC's and some entry level DSLRs, making it a handful when shooting or traveling with the camera. Its size allows for the bright 20x optical zoom lens, that blows away the lenses on most superzoom cameras. Its large maximum aperture provides outstanding low-light performance and some great bokeh for an all-in-one camera. The camera also sports a 1", 20.1-Megapixel 4K High Sensitivity MOS imaging sensor, Venus Engine processor, 2.36-Million Dot Electronic Viewfinder, and 5-Axis optical image stabilization; which just start to break the surface of all of the great features of this camera. Ease of shooting is there as well, featuring fully automatic and fully manual shooting modes. Specific scene and creative modes are also available to help you achieve a specific look or feel with your still images and video. As with all of Panasonic's cameras, the FZ2500 was designed as a still image and video Hybrid camera. Panasonic has put as much into the video end of the camera as they have the still image end, unlike most cameras that include video and a few other features as an afterthought. This all-in-one is loaded with professional features and shooting modes that surpass even most consumer video cameras. Its ability to capture 4K video as well as high-speed Full HD really sets it apart and makes this an affordable, yet powerful video tool. Handling the Lumix is a pleasure, although it is pretty large. A large rubber hand grip on the right side, manual Focus and Zoom rings, and a few on lens Fn buttons give you a great deal of control while shooting. The only odd control here is the Neutral Density filter control being on the lens, as this will primarily be a feature used on a tripod. Two command dials, and some conveniently placed controls on the back, make it easy to get the features and settings that you are looking for quickly. Built-in WiFi on the FZ2500 adds a load of convenient features and sharing abilities that take this camera past most professional cameras. The ability to view and copy images from the camera to a smartphone allows you to share your images and videos via social media or email from anywhere you have a cell signal. Connecting a smartphone to the camera also allows you to use the phone as a remote control for the camera. Unlike many mirrorless ILCs, the FZ2500 even allows you to control the zoom of the camera. This lets you operate the camera from a distance, letting you shoot from hard to reach places with ease. Composing your images is a pleasure with either the EVF or the Vari-Angle LCD. Both will show real-time adjustments to your exposures as you make setting changes, as well as showing you all of the shooting information that you could ever ask for. The amount of info is adjustable on both options, with the Vari-Angle Touch LCD also providing the camera with several extra Fn options for additional camera control. The EVF is so sharp and powerful, it actually uses more power than the LCD screen, but is well worth it as it truly gives you the feel of an optical viewfinder with all of the benefits of an LCD screen. For those of you who prefer the feel of a point-n-shoot camera, the LCD is as high resolution as you will find. Features like touch to focus and its Vari-Angle ability make it easy to shoot with, even in tough conditions. Performance from the FZ2500 is very good, and will not disappoint. It is just a little sluggish starting up as it has to extend the large zoom lens, taking approx. 2 seconds before the camera is ready to capture an image. After that, the camera flies. The AF system is very fast, with most tests taking about 1/10 of a second but rising to ½ second in lower-light and large zoom range changes. During our testing, we did see the continuous AF struggle a bit while following subjects, but that did not affect our tests here. In single shot mode, the shot-to-shot delay is 2/3 of a second without the flash and only increases to about ¾ of a second when the flash is enabled. Burst shooting is outstanding as well, producing an outstanding 11.2fps in high-speed burst capture. This is just shy of the 12fps claimed by Panasonic, but they made up for that with the continuous AF burst shooting that exceeded our expectations with 7.3fps. If that is not enough, then you can switch to the 4K burst mode which will capture 8-Megapxiel images at 30fps. All of tests were completed using a Panasonic UHS-3 16GB SDHC memory card, Program mode, ISO 6400, flash off and all other settings at the factory defaults; unless noted otherwise. Our outdoor image samples show us some very pleasing, very clear images on a rare sunny winter's day in Ohio. The bright, vivid images show excellent exposure and accurate colors in our Program samples. Our samples were also shot in iAuto mode; which provided a richer, higher contrast image thanks to the camera selecting a scene mode for each scene. These images tend to catch your eye a little faster, but the exaggerated settings are not for everyone. Aberrations and other common flaws have been controlled very well, adding to the quality of the images. No matter where or what you are shooting outdoors, the camera is always ready thanks to the 20x optical zoom lens. With a 35mm equivalent of 24-480mm (3:2), its range from vast landscapes to telephoto close-ups is outstanding. As mentioned before the maximum aperture of 2.8-4.5 provides amazing low-light performance, especially when assisted by the camera's 5-Axis image stabilization system. Looking closely at our indoor sample images, we get a much better idea of the clarity and noise levels of from the camera throughout the ISO range. At the lower ISO settings, the images are crisp and noise free as you would expect. In fact, noise does not even start to show until ISO 1600 and remains on the low side until ISO 3200. After that it starts to increase quickly as the amount of fine detail in the image decreases. Anything over ISO 6400 should not be used unless you have no other options, as it compares to low-light smartphone image quality. Assisting you with your low-light images is compact, pop-up flash unit. It has a decent range of 13.2m at ISO Auto (W), but as you zoom and/or lower the ISO settings, its effective range will decrease very quickly. The FZ2500 even features some wireless flash controls when connected to specific Panasonic Speedlites. A wide variety of scene and creative shooting modes let you choose a specific shooting effect to use to capture your images. Many of these effects are adjustable, giving you a little control over the outcome, but for the most part what you see on the LCD screen is what you get. A few samples have been included on our samples page. HDR, Multi Exposure, and Time Lapse photography options are also available in the camera's menu system. These modes can take a little time to get used to using, as they are not as easy as the creative modes, but once you have the hang of them they are not a problem. 4K burst shooting is a fantastic tool as well when you want to capture the action. Our samples were taken indoors, and they show that the camera needs a ton of light in order for you to get clean, sharp images. Shooting indoors requires incredibly high ISO settings to even have a chance. Thankfully, the FZ2500 controls noise well on up to ISO 3200. Portrait photography is a snap when you turn on the camera's face detection features. Along with being able to detect and track a face within the camera's frame, it can also detect and track the subject's eyes. This allows the camera to fine tune the focus to make sure that the eye is the sharpest part of the face, which is what really makes a portrait image grab you. Once a face and eye have been detected, the camera's settings are constantly adjusted as the face moves until an image is captured, assuring you that you get the best possible exposure. The video capabilities of the FZ2500 span way beyond the standard tests that we perform on our digital cameras, in fact, this camera deserves its own full review just for video. With that being said, its capabilities and controls are amazing, letting you take full control of the videos that you capture. High-quality Full 1080p and 4K video are both possible with a wide range of recording formats to match any of your needs, no matter how simple or complex. Microphone input along with HDMI and Audio outputs allow you to connect a variety of additional accessories to turn this into a powerful video machine. Our samples show outstanding video quality from a compact digicam, and its ease of use is up to your preferences. Powering the Lumix FZ2500 is a 7.2V, 1200mAh rechargeable Li-Ion battery. Panasonic's claims of the camera capturing up to 270 images (EVF) or 350 images (LCD) seems to be pretty accurate. Using burst shooting, we captured well over the 270 images on the first battery charge. At no point when taking the camera out with a full charge did we run into a battery issue. For longer days and video recording sessions, you will want to have a spare or two on hand just in case. The camera comes with a portable charger, allowing you to charge batteries outside of the camera, which is great as you can charge one while using the other battery and camera for other things. 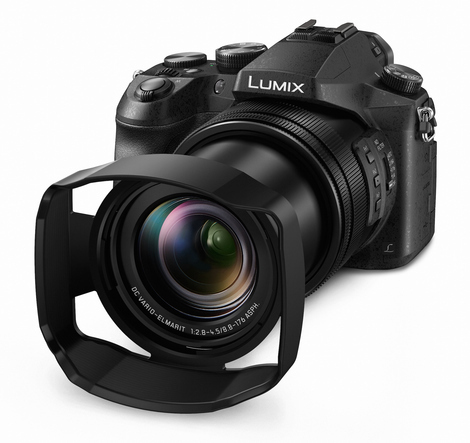 Bottom Line - The Panasonic Lumix FZ2500 is a powerful and user friendly digicam that is enough to satisfy anyone's needs for still image photography and videography. The powerful image processor, 20.1-Megapixel High Sensitivity MOS sensor, and outstanding Leica 20x optical zoom lens make sure that you are prepared for any shooting situation that you come across. From iAuto to full Manual, there is a shooting mode to suit anyone, including several creative shooting modes to assist you with adding to your overall creativity. 4K video recording, 4K burst image capture, and WiFi capabilities round out an amazing set of features that make sure you never miss a shot and can share them from anywhere. With a MSRP of US $1,199.99; this camera falls into the higher range for compact super-zoom cameras, but its performance, features,and image quality are worth the money if you are looking for a top-of-the-line, all-in-one camera.